I'm always on the lookout for new ice creams to try (I love ice cream, probably a little too much). For whatever reason, I prefer ice creams that come in individually sized serving cups (especially when they are on the big side). It is kind of weird but there's something about eating the ice cream out of the cup that I find more pleasing than a bowl. So, when I recently discovered these unique rice milk ice cream cups made by Organic Rice Divine at Whole Foods, I decided to give them a try. The flavor of ice cream cups I purchased is called Strawberry Swirl. Each cup contains strawberry flavored ice cream with strawberry swirl sauce (kind of like a sundae, which is an added plus!). The ice cream cups also come in a Vanilla Fudge Swirl flavor that I bet is great, but I have yet to try them. In terms of taste, the ice cream has a unique rice-milk taste to them which I find pleasing, however, if you aren't into the taste of rice milk products, these probably aren't for you. 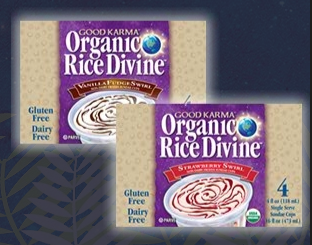 The organic rice divine ice cream cups are organic, lactose free, dairy free, gluten free and also vegan. At 160 calories, with 6 grams of fat and 1 gram of fiber, they aren't the lowest calorie ice cream in the world, but I think they are a nice treat for an occasional splurge. PS. If you aren't into rice milk products or can't find rice divine at your local supermarket, I highly recommend these Eating Right low calorie ice cream cups which you can buy at Safeway or Julie's Ice Cream Sandwiches which you can buy at Whole Foods. thanks for the product rec! you know, now that i think about it, i HAVE seen these at whole foods before! i've never really taken the time to look at them, though, so thanks for the feature! I missed your post! I figured that you were busy at work. Those sound great!! Are they soy-free?? Glad you're back :) These look great! Great find. With the warm weather finally on its way, these look perfect. I'll look for them during this weeks shopping expedition. Ooo I love new ice cream finds too! You can never have enough =) It's soo hard being at college and only having a super small freezer which doesn't even keep ice cream frozen! I cannot wait till I get a FULL SIZE freezer in 2 weeks to succumb to my creamy cravings--I will definitely keep my eye out for these ones. Thanks--glad your back! Those sound delish! I'm glad you're back! Your blog is very nice. I simply love icecreams, they are so yummmy...but have never tried rice milk ice creams. These do sound yummy! I wish Almond Breeze made ice cream. Although, that might cause problems for me. :-) I love all of the interesting varieties available at the store now. It's a far cry from the ice cream choices that were around when I was a kid. Thanks, as always, for the review! I just saw those at Whole Foods yesterday. But I prefer my nonfat frozen yogurt by Stonyfield Farms. YUMMYYY goodness right there! Miss seeing all your great finds. Hope all is well and thank you for trying with the cuties. I think it is the delivery company that mistook my address because they have been doing that with a lot of my other packages. So in turn it has been sent to a different house and the ppl there probably ate them instead of returning them. it's ok though. thx for trying! Hope to see more good finds soon! Please come back, your posts are missed! Thanks for sharing I would also like to taste it as it is organic and healthy too. Thanks for the recommendation! I will have to try these. I miss your posts so much! I hope everything is okay with you. Oh my gosh !! Yummyyyyy! Lactose free, sugar free strawberry ice cream cups! Me too... I like the cups best, as they are "pre-measured!" Thankyou so much, I'm glad I found your blog, and am so excited that I forgot where I found it from! Ohhh, now I know, hahaha...I did a Google search for Stevia! I must try one of these, I have never ever tried a rice milk product but you have convinced me! What an awesome blog- keep up the good work and thanks so much for sharing your recommendations! Hi Juliet, I don't know about anyone else but I'm kind of worried about you. The posts are great, the food looks delicious but I haven't heard from you in a long time. If you could post anything(even if it's not about food) to know everything is well with you would be greatly appreciated. Take care and God bless you. I miss your posts!! I hope everything is OK with you!! Please post and let all your fans know you are OK. Take care and hope to see you posting again soon!